I love Christmas Sanrio Plushes, especially when it's really beautifully designed and exclusive. Below is two Momoberry Christmas Plushes that I will treasure forever. 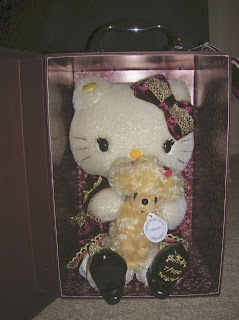 ^ The first 2007 Christmas Plush in Box set, I was very lucky to get Plush # 7 out of 100 plushes made. 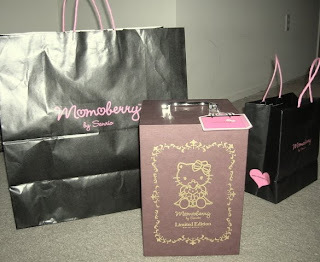 I really would be happy with any number and just to have my very own Momoberry X-mas Plush with her beautiful red dress that matched the theme for the Holiday season was a wonderful feeling. 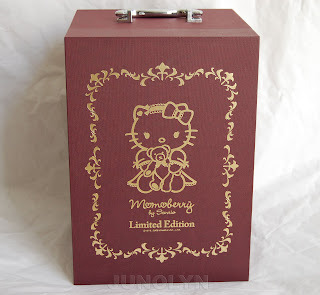 For the 2008 Pink Plush in Box set, I had no idea that Sanrio was selling another Momoberry plush that other Hello Kitty collectors have told me sold for a lot of money. My guess would be nearly $400. 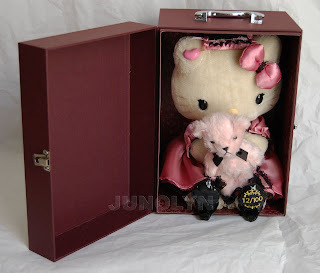 Thankfully, I got my 2008 plush at a reasonable price from a really sweet and nice Hello Kitty collector. Below are a couple of sanrio Pen/Pencils that are up for sale on my eCrater Store. If you would like more details regarding any of the pieces above, please visit my store's link on the right side.